www.OxnardBicycles.org - Ride a bike in Oxnard.............................. The safe OxnardBicycles.org way!www.OxnardBicycles.org | Ride a bike in Oxnard………………………… The safe OxnardBicycles.org way! “We are proud to announce that the Oxnard bike HUB will open on Tuesdays from 12-4pm at Community Action of Ventura County, providing do-it-yourself bike repair to Community Action clients and the public! BikeVentura staff will be on site with tools and expertise to help people fix their bikes or better outfit them to carry their goods. A bicycle may be the only option for many CA clients for getting to work, school, or essential services, and our low or no-cost services will keep these accessible, while also teaching skills that promote independence. How can you can support the Oxnard Bike HUB? by donating your bikes or bike parts to the program anytime during the open hours of Community Action: 8am – 5pm Monday through Friday. We’ll either fix it up with the help of volunteers or use the parts to keep repair costs low. The next ride will be Saturday February 11th, 2017. Assemble at Park Plaza (5th & B Street). Be read to depart at 10:00am. This is a slow paced, all bicycle friendly, no drop ride. It is held the second Saturday of each month so mark your calendars. There will be a community ride this month on Saturday December 10th. Assemble in Plaza Park (corner of 5th and B). Be ready to depart 10:00 am. A group of riders meets every Sunday At 1:00 for a no drop family oriented bicycle ride. It is a slow pace no drop ride geared to beach cruisers and up. It is about a two hour ride. It assembles in the 1900 block of S. Harbor (Wooley and Harbor) around the cement tables in front of the Subway. These rides are a no drop slow paced ride. Beach cruisers, 3 speeds, … are all welcome. Typically the rides last for about 2 1/2 hours with rest stops and bathroom breaks as needed. Learn how to navigate the city through residential neighborhoods. 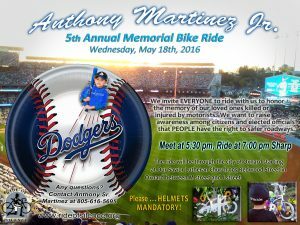 We will meet at Plaza Park and start riding at 10:00. Mark your calendar. The next Community Bike Ride will be Saturday September 14th. Arrive at Plaza Park (5th and C Streets) in time to begin the ride at 10:00. The next community bike ride will be Saturday August 13th. I apologize for posting later than normal. Mark your calendars for the second Saturday of each month. There will be a Community Bike Ride each month. The June 11th ride was worthwhile. There was a heavy mist that cleared about 10:10 am. The ride was n beautiful weather. I hope the weather for the July 9th ride will be as nice. A community bike ride will take place Saturday June 11th. Meet at Plaza Park and be prepared to depart at 10:00. The ride this month will be to Hueneme Beach. These are two links to provide further information. Cut and paste into your browser. This ride takes place on may 18th on all continents. Please click on Image and enlarge for details.